I use my cutting boards a lot, so I need them easily accessible. My dad got me three small ones for Christmas, which was great but they were kind of adding to the visual clutter around my countertops and stove top. 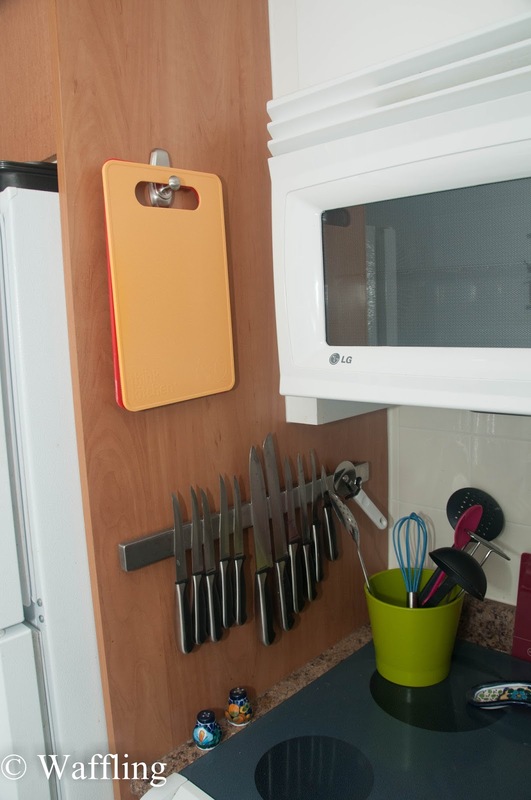 In a small space, you gotta go vertical- so I decided I wanted to hang a hook above the knives so that I can hang the cutting boards from them. Except I didn't want to drill a hole into the wood (the knife rack is a great option for any future owner...hook for cutting boards may be just a Casey thing). 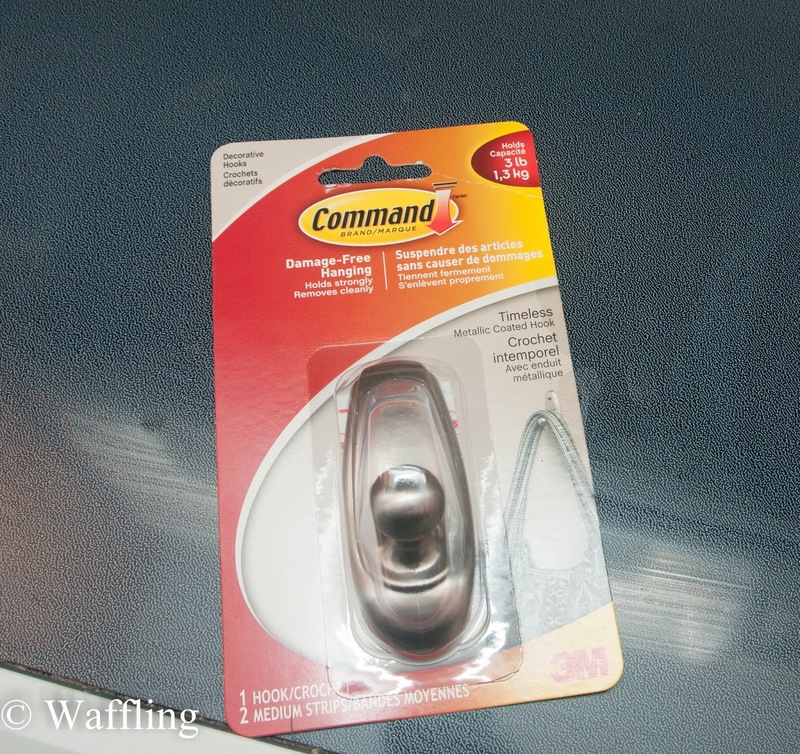 So I ended up looking at Command Strips' line of metallic hooks (I should seriously be sponsored by Command Strips). I found a square I really liked, but it was $15, which seemed a bit redonk for a hook so I ended up getting this small, but still nice one. And just a few minutes later I had cutting board storage! FYI- The microwave door doesn't hit it (I tested that out first before I placed it). So there you are! 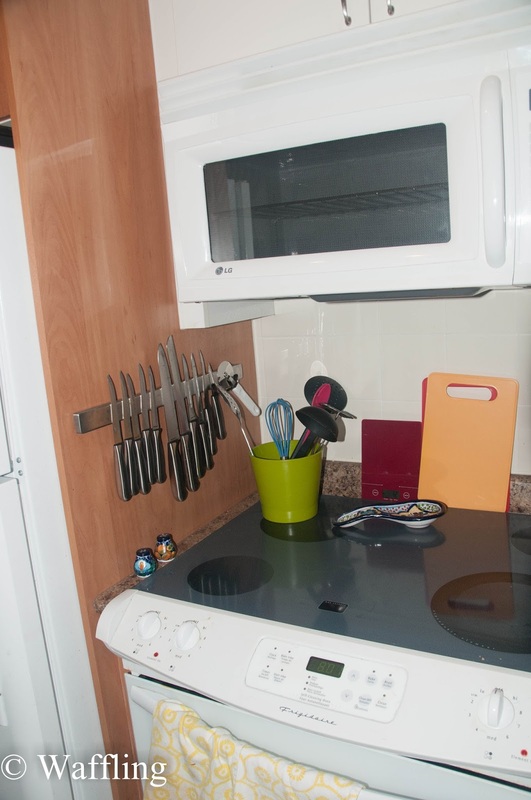 A quick little Friday post about how I solved a little problem in the kitchen. Any tips to share on tiny kitchen storage? I'm pretty sure I have a couple of those exact hooks and I love them. So handy! I'm glad you figured out your cutting board situation and I hear ya on wanting something that is removable since future owners may not like the same thing as you. I should do a post some time of how crazy my kitchen looks when I bake!! I wish i had more space! Just so you know, more space doesn't mean less crazy. It never ceases to amaze me how bad my kitchen looks after I spend some time in there. More space just equals more mess!